Band performance times and the initial brewery list have been announced for 98KUPD's BRUFEST presents Sabroso: Craft Beer, Taco & Music Festival powered by Gringo Bandito, Saturday, April 15 at the Fear Farm Festival Grounds in Phoenix, AZ. 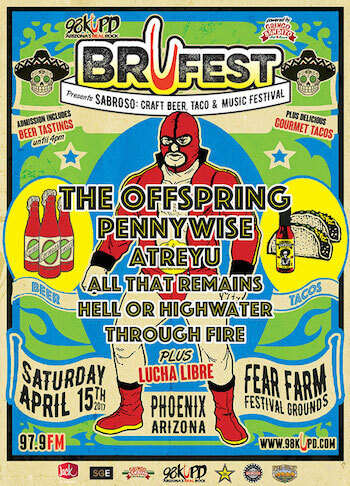 BRUFEST will feature live music from The Offspring, Pennywise, Atreyu and more, plus gourmet tacos, complimentary craft beer tastings (until 4:00 PM) from some of the best breweries in the country, lucha libre style wrestling, and free samples of Gringo Bandito — Dexter Holland of The Offspring's top rated hot sauce. The festival comes hot on the heels of the sold out Sabroso: Craft Beer, Taco & Music Festival at Doheny State Beach in Southern California on April 8. Tickets for Arizona's Sabroso are still available at: https://brufest.frontgatetickets.com. BRUFEST presents Sabroso runs from 1:00 PM to 10:00 PM on Saturday, April 15, with VIP and Early Entry beginning at Noon. Those with VIP tickets will enjoy an extra hour of complimentary exclusive tastings in the VIP lounge. Guests under 21 may enter at 4:30 PM. Tickets for 98KUPD's BRUFEST presents Sabroso: Craft Beer, Taco & Music Festival are on sale now at https://brufest.frontgatetickets.com. Tickets start at $49 for General Admission. Early Entry Tickets are $65, and VIP Lounge tickets, which include a VIP front-of-the-stage viewing area, are $125. All tickets for guests 21+ include craft beer tasting until 4:00 PM. Parking will be available for $10 per car and a ride share dropoff and pickup area will be located near the festival entrance. Visit www.BRUFEST.com for details. Fear Farm Festival Grounds is located at 2209 N. 99th Ave. in Phoenix, AZ and is easily accessible by car from the Southwest region and by plane via Phoenix Sky Harbor International Airport. Sponsors for BRUFEST presents Sabroso include KUPD, Hensley Beverage Co, Jack In The Box, Gringo Bandito, Rockstar Energy Drink, and more. The festival producers encourage attendees to drink responsibly. Brew Ha Ha Productions (BHHP) is Orange County, California's most successful craft beer event producer. Its team brings years of successful event production and business experience along with an inside view of the craft beer industry and its enthusiasts. Fueled by a desire to promote craft beer, along with a vision of a different kind of beer fest, the Orange County Brew Ha Ha Craft Beer Festival was conceived. BHHP is known best for their events like the Orange County Brew Ha Ha, Brew Ho Ho 'Holiday Ale Festival', Sabroso 'Craft Beer & Taco Festival' and the Brew Hee Haw at the OC Fair. The events have been a resounding success and the OC Brew Ha Ha has been voted "BEST Craft Beer Festivals in Southern California" six years in a row by the Orange County Beer Society. In six short years, BHHP has enjoyed unprecedented growth making them the largest craft beer event producers in Orange County and one of the largest on the west coast. 98KUPD, Arizona's REAL Rock, aka The Big Red Radio, is Arizona's legendary rock station blasting Active Rock for the last 38+ years and the home of the #1 morning show in media for over 16 years, Holmberg's Morning Sickness. UFest has been a staple event for the station for over 20 years, hailed as the biggest party of the year with some of the format's largest artists, including Disturbed, Pantera, Ozzy Osbourne, Deftones, Alice In Chains, Avenged Sevenfold, Korn, Rob Zombie, Metallica, Stone Sour, Volbeat, Five Finger Death Punch, Slipknot, Shinedown, Chevelle and many more.